With the weather turning all cold and rainy, the kids are going to get stir crazy. Why not have fun in the kitchen with them making a Thanksgiving Day treat! 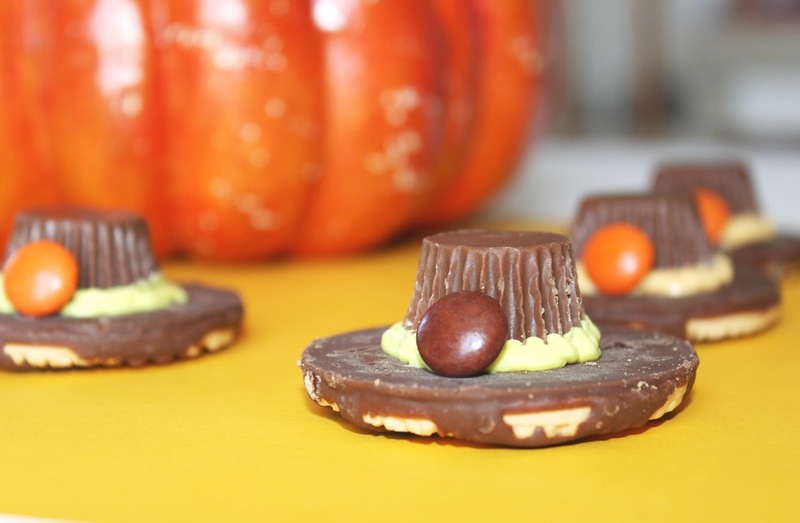 These Thanksgiving Pilgrim Hat Cookies are so cute, easy to make and super yummy! First you will want to mix your frosting with the food coloring. I put a little in a bowl and added food coloring to it and mix till it is the color you are wanting. I did yellow and a light orange for mine. Put your frosting in a piping bag ( I used a sandwich bag with the tip cut off). Next lay your cookies face down on some wax paper. Then pipe out a circle around the center whole of the cookie. Place the peanut butter cup on top of where you put the frosting. Then pipe around the peanut butter cup. 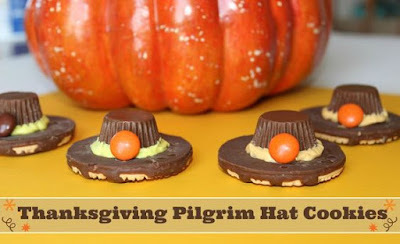 Next get a Reese's Pieces and place a little frosting on one side and stick it to the peanut butter cup. Seriously how cute are these cookies and a fun way to spend some time with the kids!